Downloaded. Thank you, very fresh!! I love mods like this. Simple, to the point, impossible for it to conflict with other mods, and fixes a glaring problem in the game. My only minor complaint is that in a couple of the paintings, the clothing looks a little too modern for a medieval setting. But its a small issue because you have to look very closely to notice it. How did you manage that your selection of paintings are fitting the atmosphere of oblivion so well? I don't think it fits the "atmosphere of oblivion so well". It just happens that the 1st picture I saw was with kids outside wearing Napoleonic head sets and uniforms (paintinglandscape01d.dds). Most seem to be set in the early to mid 1800's. Now I'm not a Lore Purist, but those that are will probably want to look elsewhere. Still, I recognize that a lot of time and effort went into this and that should be pointed out. Wintermane555, you're completely right. I've tried to avoid the lore-unfriendliness by mostly using landscapes, but with many landscapes they blend together a bit, so I've added some variation. And in those non-landscape paintings you may notice that the architecture, clothing, tools etc. belong to different times. Also, thanks for your compliment! It did take a lot of work. Since your comment I've thought about how to make it more lore-friendly, and the only way I can think of is by using screenshots (and maybe using some photoshop tricks). I think I've changed the UV-mapping on all meshes in version 2 (so that the painting textures would no longer be stretched), so you could replace the textures with any image which is the right size and in dds format. Paintings Galore by Trollf seems to have some textures that could fit without much work. http://www.nexusmods.com/oblivion/mods/9897/? 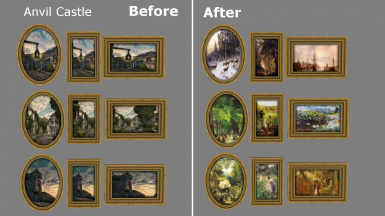 If you want to, you (or anyone else who feels like it) can make this new paintings mod with the meshes in my mod. No need to ask permission. Trollf has uploaded their mod as a modder's resource and doesn't mention anything about permissions, so I think you can use their mod without asking as well. Beautiful, many thanks for sharing this! I will use tomorrow, go home. <3 Thank you. Well selected, and presented. Thanks. I like to have a clear picture and description of mods before I download them, so I should give clear pictures for my own mod as well. 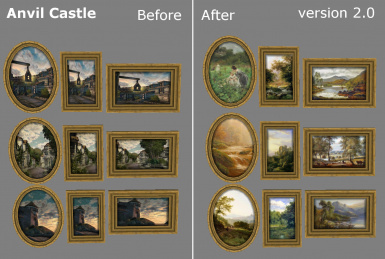 Also, the paintings appeared dark in the game, so download the update or the new version if you still want to use them. Ah, not being currently in Cyrodiil, I had no chance to try it out. But I know the problem from my own set of paintings I tried my hands on: In TestingHall, and in the Temple in the temple district, where I tested them, they looked alright, so I published the plugin. But alas, _much_ later, when I tried them somewhere else, the paintings were all dark! So I am eager to learn what the solution is. Again, thank you for doing this. 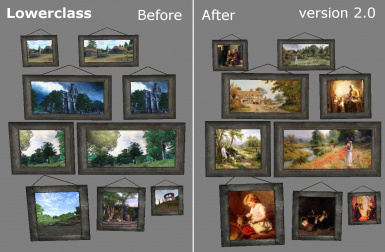 For me, the solution was to add a blank normal map to each painting, but I see that you already have normal maps for yours? I'm not sure if our problem is the same, because my paintings appeared dark in the testinghall as well. They were fine in my own, custom made testinghall, with very high background lighting, so that's why I didn't notice. Thank you modders who, like you, still have the desire to give this game a revival atmosphere. It's a very beautiful work. I like to stay and admire scenics so nice in each home castle and inn.